Will Lara's mother come back? I would really want to see Lara's mother - Amelia Croft come back in Tomb Raider 8. Because I assume that Lara will go looking for Avalon in the next Tomb Raider Game. I think that would be a really good story line if Lara could see her mother again. What's with all the random topics? Since you first came here, all I've seen were 20 topics a day from you, . Uh...yeah, anyway, I'd be obvious to have her mother in the Legend continuation. Probably some tragedies, but eh. I think that if Amelia Croft came back, she'd be all wierd - she won't recognise Lara as her daughter, but probably as someone from her past - not quite a stranger but not a loved one/ family. This would be because she would be swayed by power/love/something in Avalon, or maybe she won't want to leave Avalon because of the amount of time spent there. Amelia Croft will not look like herself either, transformed like either Amanda (goth-like, vengeful and scary) or Natla (skin-less, creature-like and scary). This woulde result in a life-and-death battle between the two Lady Crofts, where Lara will win, sail away into the sunset and look over her shoulder t the pile of rubble the used to be Avalon and the person that used to be her Mother. Amanda may come back, because she probably has some info on Avalon, although co-operation between Amanda and Lara seems far-fetched. ^ I still don't get what Avalon means.. I have beaten the game, but it's still not so clear..
Metroida, 100% Tomb Raider Fan! Avalon is a mythical place, kind of like Atlantis but with a different story behind it. How do you get there..? Thx for the answer, btw..
*Avalon (probably from the Celtic word abal: apple; see Etymology below) is a legendary island somewhere in the British Isles, famous for its beautiful apples. The concept of such an "Isle of the Blessed" has parallels in other Indo-European mythology, in particular Tír na nÓg and the Greek Hesperides, the latter also noted for its apples. Avalon is also said to be the place where the body of King Arthur is buried. The corpse was supposedly brought on a boat to Avalon by Arthur's half sister, Morgan le Fay. According to some legends, Arthur sleeps there merely to awaken at some future time. The tradition that Arthur was buried at Glastonbury Tor appears to have taken shape from as early as the beginning of the 11th century. Before the surrounding fenland in the Somerset Levels was drained, Glastonbury Tor's high round bulk rose out of the water-meadows like an island. According to several chroniclers (including Gerald of Wales), it was during the reign of Henry II that the abbot, Henry de Blois, commissioned a search of the Tor. It was at a depth of 5 m (16 feet) that a massive oak trunk or coffin with an inscription Hic jacet sepultus inclitus rex Arthurus in insula Avalonia. ("Here lies King Arthur in the island of Avalon") was apparently discovered. The remains were reburied with great ceremony, attended by King Edward I and his queen, before the High Altar at Glastonbury Abbey, where they were the focus of pilgrimages until the Reformation. However, the Glastonbury legend has been perceived by some as a fraud due, among other things, to the perceived anachronistic inscription which would have been more fitting to the 10th century than the 6th, the lack of any mention of said discovery in the 10th century, which would not have gone unheard of, added to possible ulterior motives from the abbey. Other theories point to l'Île d'Aval or Daval, on the coast of Brittany, and Burgh by Sands, in Cumberland, which was in Roman times the fort of Aballava on Hadrian's Wall, and near Camboglanna, upwards on the Eden, now Castlesteads. Coincidentally, the last battle site of Arthur's campaigns is said to have been named Camlann. Others have claimed the most likely location to be St Michael's Mount in Cornwall, which is near to other locations associated with the Arthurian legends. St Michael's Mount is an island which can be reached by a causeway at low tide. The matter is confused somewhat by similar legends and place names in Britanny. Although primarily known in connection with King Arthur, Avalon is sometimes referred to as the legendary location where Jesus visited the British Isles with Joseph of Arimathea and that it was later the site of the first church in Britain. This location of the Isle of Avalon is usually associated with present day Glastonbury. The first extant reference to Avalon is in Geoffrey of Monmouth's History of the Kings of Britain as the place where Caliburn, later Excalibur was forged, and as the place where Arthur was taken to heal his wounds. In the subsequent Vita Merlini this place is referenced as "the island of apples". Avalon also plays a role in non-Arthurian French literature, such as in the story of Melusine. Howzat? I don't know how to get there, it may be an island... Lara will find a way. @Metroida, Lara explains it in the Peru level. I can't believe you don't know about Avalon, . Aww it's okay... just read my previous essay and you'll be fine! And sorry I haven't been on for so long, I just got started playing Tomb Raider again yesterday. Since my last visit here, I've moved from England to the USA [yes, for good]! Well, welcome back. Enjoy USA. Well, it would make sense to have her in TR8. I mean, it's basically about her! That's like having a game say "Lara Croft Tomb Raider", and not have Lara in it.... :. Which would be dumb, but whatever, they should have her in TR8. That reminds me, what the hell was the end of AoD about? What happened to Kurtis Trent and everyone? 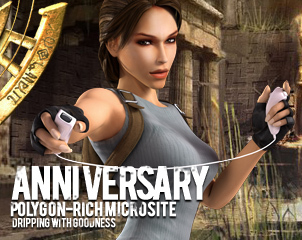 : It was like some random Tomb Raider story that didn't fit in very well....I still wonder about it to this day. Kurtis supposedly died, but when Lara destroyed Karel and the Sleeper, Kurtis' frisbee thing activated, and pointed in the direction of the exit, for Lara to find someone or something. If you pay attention in the game, you'd see that it comes back to him no matter what. I think that it activates and brings Lara back to him. But she grins, exits and the game ends, leaving the player to decide what happens. But getting back on topic...Amelia IS going to be in the new game. If not, that's very disappointing. You never know... just to spite us, they may include Amelia when we least expect it.. so least expect her to be in TR8..